NO LIGHTS? NO POWER? - LOCAL FAULT FINDING EXPERTS! 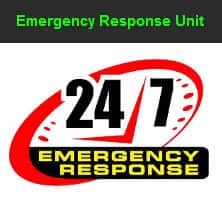 - EMERGENCY RESPONSE - 24/7 - - $0 CALL OUT* - ON TIME OR IT'S FREE!!! - CALL TODAY FOR FAST SAME DAY SERVICE! 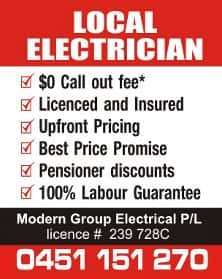 Looking for a fast, friendly, reliable same day Electrician in Blacktown? 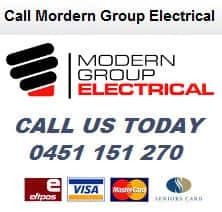 Modern Group Electricals Blacktown Electricians, are waiting for your call today. Our rapid service and honest upfront pricing is trusted by thousands of homes and businesses across Sydney. Our Blacktown Emergency Response unit is on standby 24hrs a day 7days a week ready to respond to your unexpected electrical emergency. 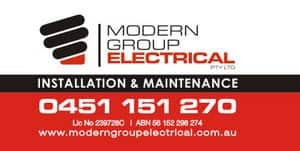 At Modern Group Electrical no job is too big or too small, we are happy to investigate, repair or replace any of your Blacktown electrical jobs or emergencies. So call us on 0451 151 270 to speak to a qualified Blacktown electrician today. Excellent, Friendly and reliable service. 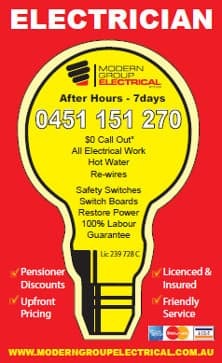 Recommend them for anyone needing electrical work. Great service, called Nick in the morning and he came that same afternoon. I was worried about unreliable tradesman but he was excellent and explained every thing to me. Over all very happy with his customer service and pricing. Thanks Nick.